Around 4-ish on a Thursday morning two years ago today, I got a text message on my phone. But when I picked it up, there was no message. Still, the sound of a text message was so distinctive as to be unmistakable. Uncharacteristically, I rolled over and was back asleep almost instantly. Just a few minutes later, I was freezing—colder than I have ever been in my life. Colder than I would have been had I been sleeping in an ice-covered lake. The feeling lasted for about five minutes. An hour or so later, after getting my husband off to work, I briefly considered going back to bed for a couple of hours to make up for lost sleep. But I had so much to do. My son was coming home in a few hours, and I wanted to get the house cleaned so we could get some work done on the projects we had started…projects meant to help him achieve his dreams. Around 11:22 that morning, I messaged Brian, who had spent the night with a friend and asked what time I could expect him home. I was anxious to get started. Almost immediately, there was a knock at the back door. I figured it was Brian, making a joke by knocking since it coincided with the message so closely. But when I opened the back door, a stranger stood there. On his hat was the word ‘CORONER’. And just like that, the world as I knew it ended. I didn’t sleep for days or eat for weeks. The only good thing that came of it was that I lost a lot of weight. After about a month, I knew that I had to do something to distract myself from the unrelenting grief, the feeling that Brian had fallen off a cruise ship in the middle of the ocean, in the dark of night and I couldn’t find him. I started going to art classes, and while it didn’t take my mind off Brian’s absence, it did allow me to begin the process of learning how to live in my new reality– a reality I desperately wanted to reverse. It’s still an ongoing process, and probably will be forever. Sign up for classes in your favorite medium. The ‘classes’ I began to take were actually a combination of lessons on the first meeting of the week, and friendly get togethers for the remaining weekly meetings. Join a group of plein air painters. I never expected to use this option. I’d only tried plein air painting a couple times, and the results weren’t pretty. But it’s something you can do anytime, anywhere…well, almost. But, truthfully, if the weather is too ugly to get out, you can set your easel up by a window or go to a café and paint there. The options are endless if you use your imagination. And if the results aren’t as nice as your studio work, take heart in the thought that you will improve with time if you stick with it. Volunteer at a local gallery or art show venue. Most of these places are thrilled with volunteer help. Many run on limited budgets and can use the help. And if you are showing at the same time, it can open up even more opportunities. At the first show where I volunteered, I won a pair of honorable mentions. Not big or prestigious things, but my first art awards. I was giddy with excitement—unreasonably so considering the minor import of the awards. But as I sat at the reception desk, trying not to let my excitement show, I heard Brian laugh in my left ear, as if he were standing right behind me. And the laugh was the exact one he would have used in just such a situation. I think that because my concentration was divided between excitement over my awards, handing out programs and answering questions, and trying not to let my excitement show, that somehow opened me up to hearing Brian’s laugh. Whether it was real or illusion, it remains one of my most precious memories. Display your art at shows or galleries. This ties in with the last but takes you a step beyond just volunteering. At another show a month later I made my first art sale. Again, it gave me a giddy feeling of excitement, but also a bit of fear because I had two pieces in the show, and I had made a sale of one of the pieces through social media. When I called the show coordinator to ask that the piece be marked as sold, she informed me that I had already sold one of the pieces. For about a minute I was terrified that I had sold the same piece twice! Fortunately, the purchasers each wanted different pieces. In total, I sold six pieces to two new collectors between social media and the show that day. Teach art at your local youth or assisted living centers. This was the hardest one for me because it required more organization on my part than the previous options. And anyone who is grieving knows that organization takes brain cells that just don’t want to engage. But sometimes, you just need to force your brain cells to do things they don’t want to do. It’s a prerequisite to getting out of the numbness. You may not feel like getting out right now, but at some point you will realize that you need to. Bonus: start a themed series of paintings (or drawings, sculptures, or whatever your medium is). 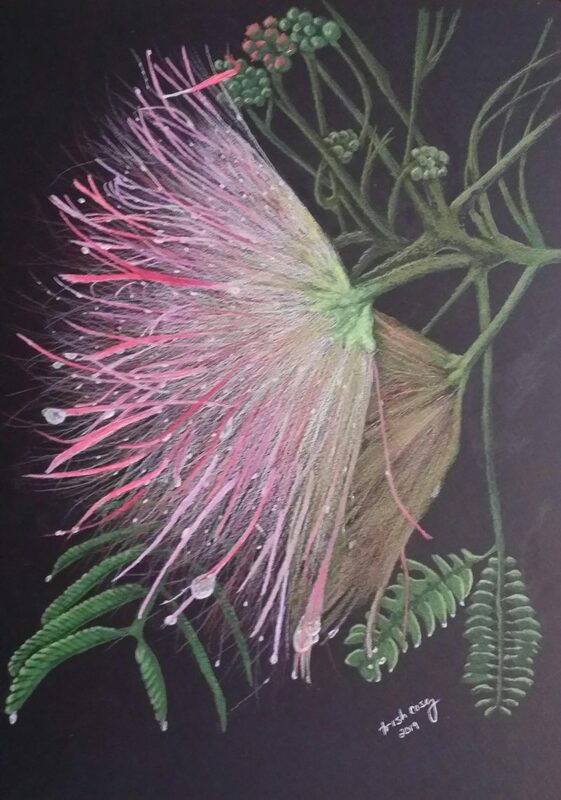 I started with a piece called Mimosa Tears as a reflection of my grief and have done (or planned) a whole series of colored pencil pieces related to heartbreak. It allows me to display my grief in a subtle way that doesn’t scare people like crying on their shoulders would. I’d like to say that doing these things has dragged me out of the depths, and certainly it’s all helped. But it’s not a magic panacea. Nothing is when the pain runs this deep. But every little bit helps. And as much of a loner as I tend to be, spending time with people who cared about the things I was going through was one of the most positive things I did to move toward recovery. Whether it takes a month, a year, or more, when you’re able, push just a little to get yourself involved in any way that feels comfortable. Or at least, possible.